Microsoft Outlook is one of the most preferred email client used for email communication. It stores user emails and other information in PST file. There are certain size limits to the pst file beyond which the information can’t be stored. Once the file reaches that limit Outlook doesn’t behave normally and sometimes results in corruption of PST file thus making emails and other information inaccessible. The latest version of MS Outlook i.e Outlook 2013 has pst file size limit of 50 GB which is enough for some users but if you use Outlook extensively you can set the size of pst file to a higher number. 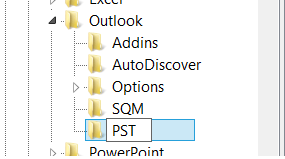 In the article I will guide you on how to change pst file size limit in Outlook 2013 by editing registry entries. While MaxFileSize and WarnFileSize registry entries are used with UNICODE pst file MaxLargeFileSize and WarnLargeFileSize registry entries are used for ANSI pst files. MaxLargeFileSize – The value in this registry entry sets the maximum size of Unicode pst. WarnLargeFileSize – The value in this registry entry sets warning level used with Unicode pst files. Click PST, and then right-click MaxLargeFileSize in the right pane. In the same way change the values for WarnFileSize, MaxLargeFileSize and WarnLargeFileSize. Note You may have to create the registry values if they do not exist. 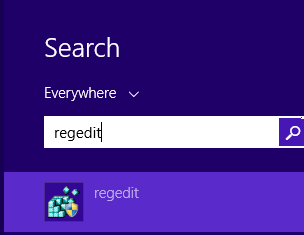 If the registry values do not exist, follow these steps to create them. Right clickOutlook, point to New, and then click Key. Type PST, and then press ENTER. Right clickPST, point to New, and then click DWORD (The screen shot for this step is listed below). 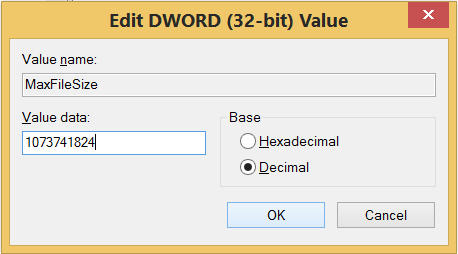 In theEdit DWORD Value window, choose Decimal and type the value in the Value data box, and then click OK.